On 1 October 2017, changes to the National Quality Framework (NQF) for Early Childhood Education and Care will be introduced. The revised standards are aimed at lifting the quality of care and regulatory compliance in Australian childcare centres. To meet the new standards, operators will be required to review their staffing arrangements and practices. Key to their success will be attracting and retaining the best possible team of people to develop programmes and deliver services, and finding better ways to administer compliance and manage risks. This is where onboarding can help. 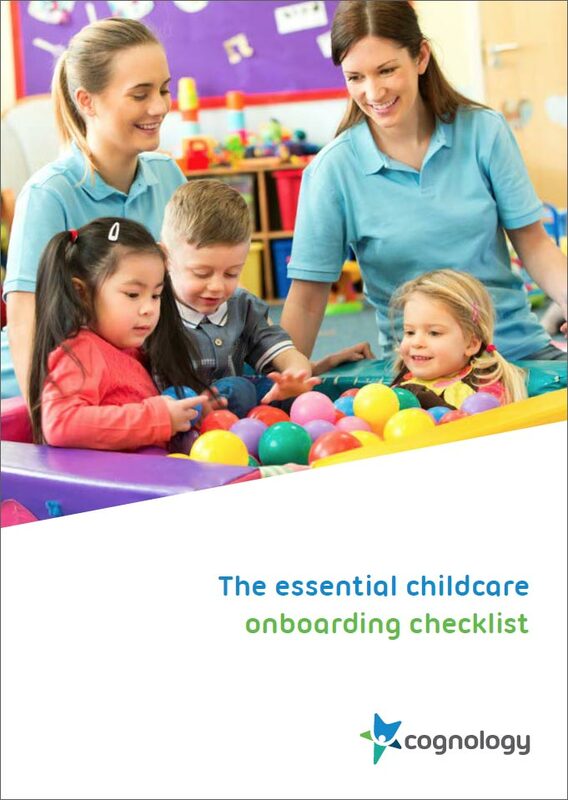 Cognology has put together a sample onboarding checklist especially for the childcare sector to get you started. Download your copy here. Cognology will not provide your email to a third party. We will periodically use your email information for news, sales and marketing purposes. If you wish to opt out of receiving such messages, you may unsubscribe here. Unlike other routine orientations and inductions (see our article ‘Turning the Tables on Traditional Induction’), onboarding unfolds over a longer period starting from the recruitment of a new employee and ends after their first six to twelve months when they are considered to be fully productive. Onboarding is an ongoing, interactive process made up of a series of formal and informal training, coaching, information sharing, goal setting, feedback, and social interventions with staff. Most importantly, onboarding is tailored specifically for each new employee according to their experience and characteristics. It is widely believed that staff turnover rates in the childcare industry sit at around 30-40%. 1 These high rates are particularly alarming given that a lack of consistency in educators has been shown to negatively affect children’s social, emotional, and language development – particularly during infancy 2. As an added bonus, better onboarding increases engagement and reduces absenteeism (another big problem for childcare). Many workers complain of burnout due to the need to work additional hours to cover absences and meet educator to child ratios. Increased attendance improves morale and reduces the burden on already stretched staffing resources. Basically, onboarding leads to greater productivity all round. Childcare is a highly regulated sector. Centre Directors must be able to demonstrate that educators are appropriately qualified, trained in federal, state/territory and local government legislation, and understand and carry out their responsibilities in full compliance with the law. Onboarding software takes the stress out of compliance audits by giving operators click-of-a-button access to employee records and training registers all in one place. The risks of incidents and injury at childcare centres are high. 1,800 serious incidents were reported in Victorian childcare centres alone in 2015. These included a child being locked on a bus for five hours, and a toddler that suffered third degree burns after running into an educator carrying a bucket of hot water. Low staff turnover and absenteeism (leading to stable and experienced workforces). Staff Turnover – CareforKids.com.au®. Web. Bauer, Talya. N. “Onboarding: The Power of Connection”. Portland State University. Whalley, Susan, and David Lihou. “Management Factors and System Safety.” Human Factors and Decision Making: Their Influence on Safety and Reliability (1988): 172-88. Print. Williams, Jeremy C. “A Human Factors Data-Base to Influence Safety and Reliability.” Human Factors and Decision Making: Their Influence on Safety and Reliability (1988): 223-40. Print. 4 Onboarding Checklists to Transform your Induction Are You Onboarding Contractors correctly?